When TV have off state you can press in series key: INFO MENU MUTE POWER – and TV on and open the service menu. after you can switchin – LOCAL SET, for example, CIS_RUSIA instead of EU. To do this, press the “FACTORY 3SPEED” in aplication, TV screen will react and can blink. This will activate the extended Service Menu. If you use extended Service Menu you will use item menu Option – MRT_Option. If LOCAL SET item active – edit it, if not turn off the TV and go into the service menu again (INFO MENU MUTE POWER) – LOCAL SET will be active. Num of PVR RECORDER – 1(record if PVR exist), PVR Support – ON, CI Support – ON, LNA Support – ON(analog amplifier). You can use hardware service remote control or a special tool Service Remote Control. Exiting SМ – simply turn the TV off – before it is recommended to reset the system settings to default – by pressing Factory Reset. 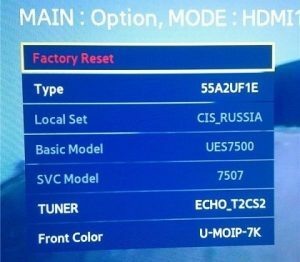 Turn on the TV go MENU-SYSTEM-LANGUAGE choose from the list Russian (or в SМ at once set the menu language in Control – Sub option-PnPLanguage change EU to RUS). Next, be sure to return to the SМ and switch on RS-232 Jack – Debug и Watchdog – Of – This will enable the service port and TV timer errors at critical values, reboot the system. If you need to change or to add the missing language menu, go Control – Sub option – language and changes to the one that is needed.